Last week, I examined the effects of New Mexico’s winter climate on the state’s landscape and the similarities I observed between the winter scenery near Abiquiú and several of Miss O’Keeffe’s works. One of these works that I was particularly fascinated with was Winter Road I (pictured in the feature photo). I admired most of the entire artist’s ability to create such a simple, elegant abstraction from the aerial view of the road that sits below the hill where her home at Abiquiú is situated. I considered the painting during a recent visit to Abiquiú, and I realized that Winter Road I reminds me of one of my favorite of Miss O’Keeffe’s works, My Last Door. Inspired by the door that provides access to the salita at Abiquiú from the house’s patio, My Last Door shares several elements that Miss O’Keeffe employs in Winter Road I. Notably, both works take an object from reality and refine its forms into an abstraction that focuses not on fine details, but on the forms of the objects as wholes. This is accomplished by reproducing the lines and shapes that make up the road and the door in monochrome black. This rendering is complimented by the setting of the shapes on a contrasting white ground, which removes the objects from their respective contexts in reality. Miss O’Keeffe uses these techniques to place emphasis on the forms through their singularity as central objects on the canvas and their chromatic disparity from the ground they are placed on. In the scheme of Miss O’Keeffe’s long and accomplished lifetime, My Last Door and Winter Road I were completed in a relatively short interval, with the former finished in the middle 1950s while the latter was completed in 1963. 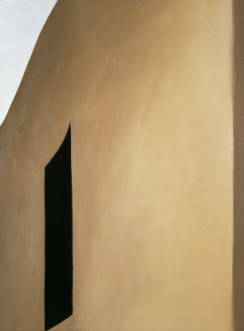 The techniques of abstraction used in both works were clearly of interest to Miss O’Keeffe at the time, as she painted multiple additional, similar works which very often were inspired by the salita door at Abiquiú. One example is Black Patio Door, pictured below. In my opinion, the artist takes the strategy of abstraction she utilizes in creating the composition and black and white palette of My Last Door and develops it even further in Winter Road I, eliminating the grey forms present around the top and bottom of the earlier painting. The exclusion of these grey fields consequently isolates the shape in Winter Road I and grants it the full attention of the viewer. While Miss O’Keeffe was focusing heavily on the unique variety of abstraction present in both paintings during the 1950s and early 1960s, its presence can be observed in her work long before this time period. Multiple striking similarities are present between My Last Door, Winter Road I, and Black Lines. 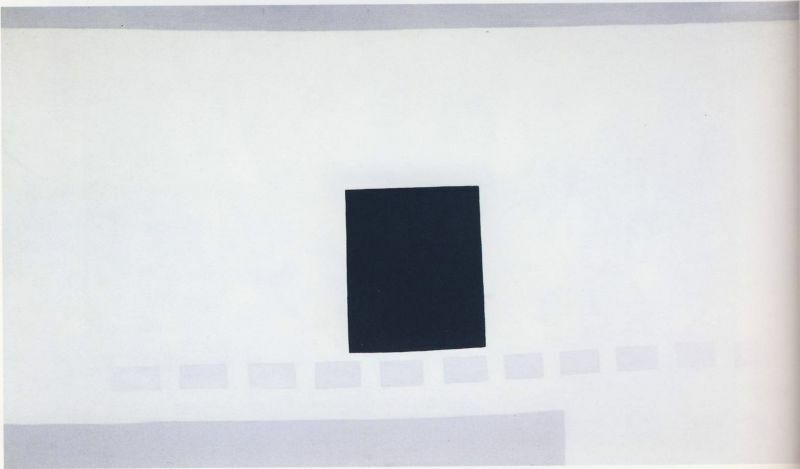 A work on paper, Black Lines shares the same elements of abstract black lines set against a white ground, but it was completed in 1916, far before the two previously discussed paintings. The similarities between Black Lines and the later works demonstrate that Miss O’Keeffe was experimenting with these abstraction techniques very early in her career and that she never abandoned them, continuously working to develop and perfect them. It was later that she used this these techniques to depict the shapes of her patio door and a miles-long stretch of the road near her home, two objects with wildly different sizes, on the same scale, as non-descript abstract shapes in My Last Door and Winter Road I, respectively.